Lifeboats have been launching from Dunbar Harbour for over 200 years and the crews have been honoured with 12 awards for gallantry. Today, the station operates two lifeboats – an inshore D class and an all-weather Trent class lifeboat. 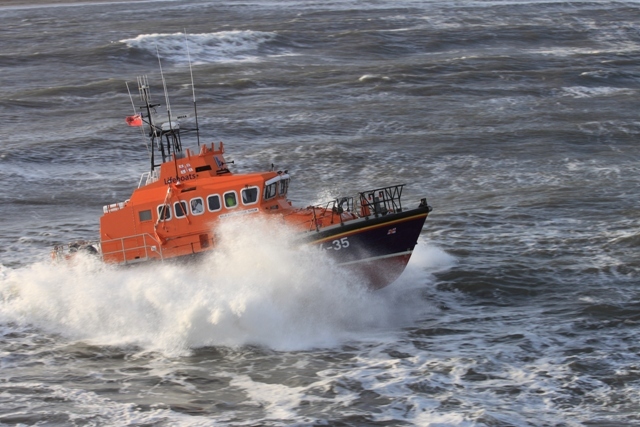 The D class lifeboat has a single 50hp outboard engine and can be righted manually by the crew after a capsize. The Trent class lifeboat was one of the first ‘hard chine’ hull design for the RNLI. She has the same geometric hull shape as the Severn class and has a sheerline that sweeps down for ease of survivor recovery. The comprehensive electronics include VHF and MF radios with DSC functionality, VHF direction finder, DGPS with electronic chart system and radar. Comprehensive first aid equipment includes stretchers, oxygen and Entonox. Other equipment includes a portable salvage pump carried in a watertight container.